Like bromeliads, orchids are epiphytic plants. That means that in their natural habitat they don’t grow in the dirt, they grow on other plants. Don’t worry they don’t feed on other plants, they just use them as a growing support. 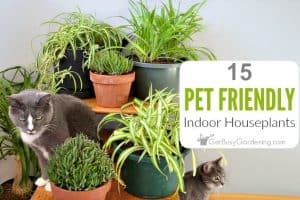 They are non-toxic (in fact, it’s common to see the flowers used as garnishes in fancy restaurants), and they are pet friendly houseplants too! There are tons of different varieties of orchids, and many of them can be grown as houseplants – though some are fussier than others. 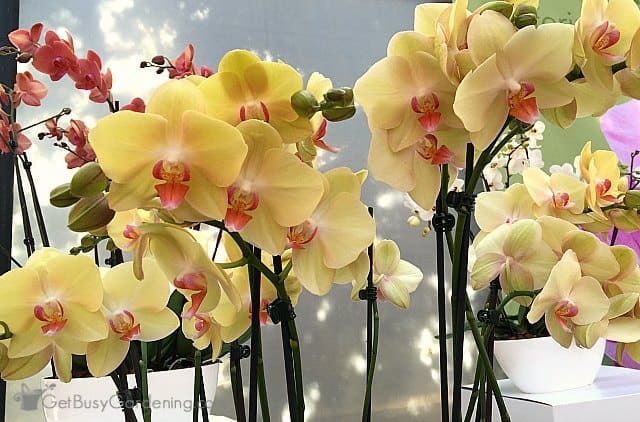 Phalaenopsis orchids are the most commonly sold variety because they aren’t that much harder to grow than your average houseplants (though they do require extra care if you want them to bloom). Once you get the hang of caring for your orchids, and learn the tricks to get them to rebloom, they make excellent flowering houseplants. The delicate flowers dangling from skinny stems is what makes orchids look so exotic… and it’s also what makes them look like they’d be really hard to grow. 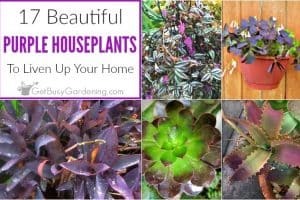 But they are surprisingly easy to grow houseplants. I’ve broken down these orchid plant care instructions into small chunks to make it easier for you to digest, or simply skim through to find exactly what you’re looking for. Orchids like to be watered consistently, but don’t like soggy feet. 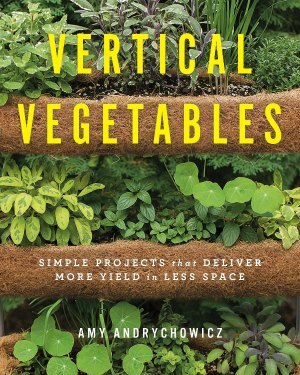 Allow the medium to dry out slightly between waterings, but not to the point where the plant starts to shrivel. Water thoroughly until the water comes out the bottom of the pot. Allow the water to drain fully, and never allow the pot to sit in water. 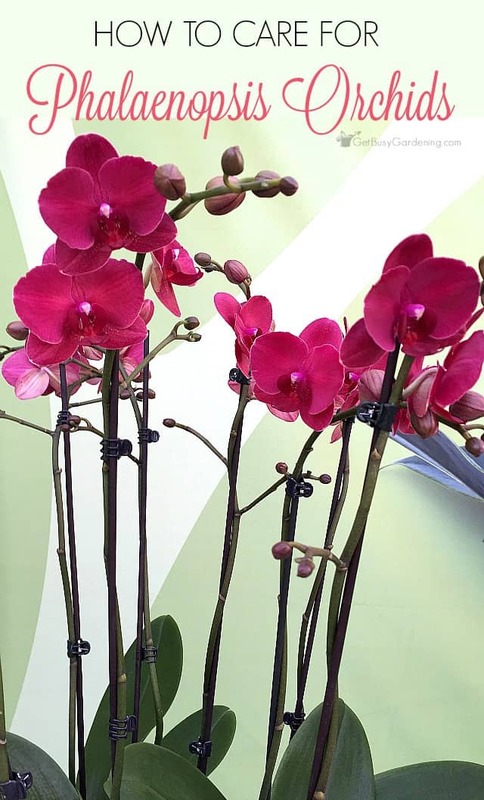 It’s especially important to use room temperature water on orchids, they are very sensitive to temperature extremes. Because they are a tropical indoor plant, high humidity is important for orchids. Set the plant on a pebble tray to increase humidity, or mist your plants on a regular basis. If you mist your orchids, make sure to do it in the morning so the leaves are dry by the evening to prevent disease or fungus issues. To increase the humidity levels for your orchid house plant, you could grow it in a sunny bathroom or near the kitchen sink, or add a humidifier in the room for your plants. 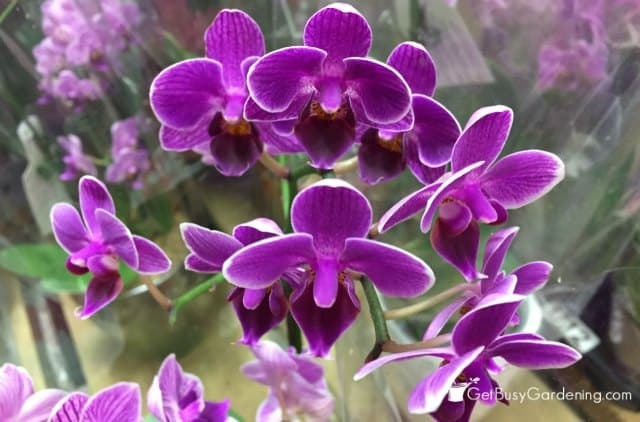 How Much Light Do Orchids Need? The phalaenopsis orchid likes bright, indirect light. Never put your orchid house plant in full sun or it could burn the tender leaves of the plant, and the plant will suffer with too much sun. 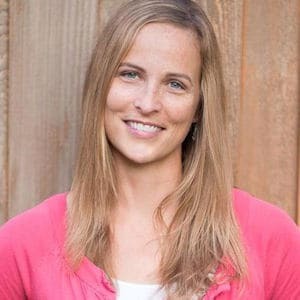 Indirect light from a south facing window, or filtered light in an west or east facing window are the best choices. 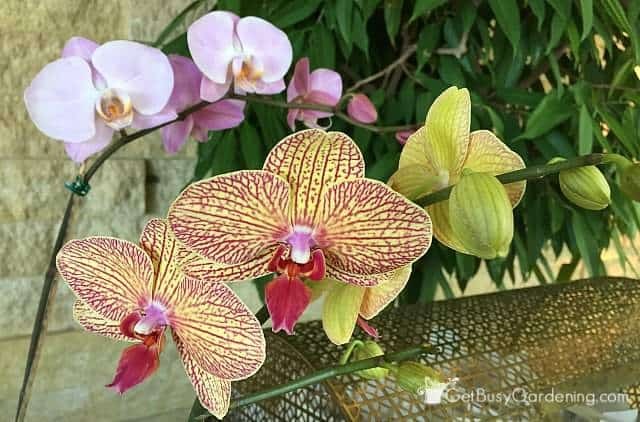 If you aren’t lucky enough to have the right amount of natural light in your house for growing orchids, you can buy a plant grow light and set it on a timer to give them the perfect amount of light. Can Orchids Be Planted In Soil? No. 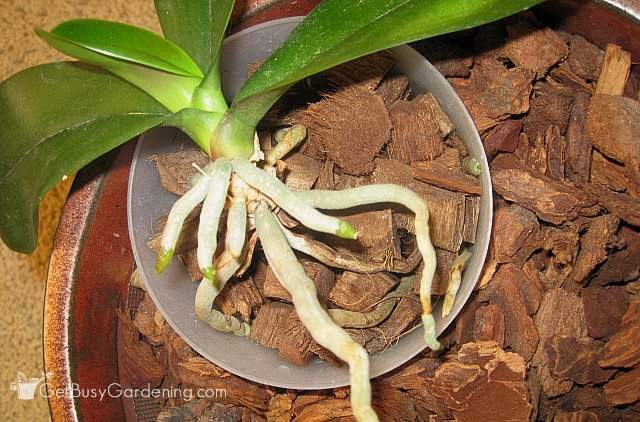 Do not use regular potting soil for orchids. Since orchids are epiphytes, they get their nutrients and moisture from the air and not the soil. Orchids grow on the bark of trees in their natural habitat, so a potting medium made from bark (specifically made for orchids) would be the best, rather than planting orchids in soil. This is the stuff that I use… orchid potting medium. Yes, phalaenopsis orchids will perform their best if you feed them properly. 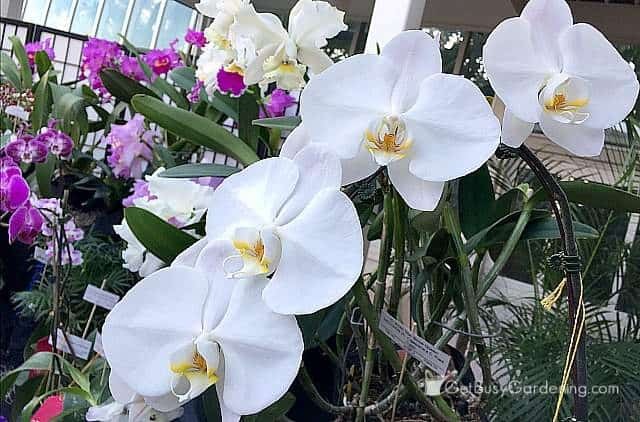 Generally speaking, it’s best to feed orchids using a weak half dose of plant fertilizer every time you water during their active growing season (May-September). Don’t fertilize orchids during the winter, or while they are flowering. I recommend you buy a fertilizer specially made for orchids (rather than just a general houseplant fertilizer) and follow the directions on the package. 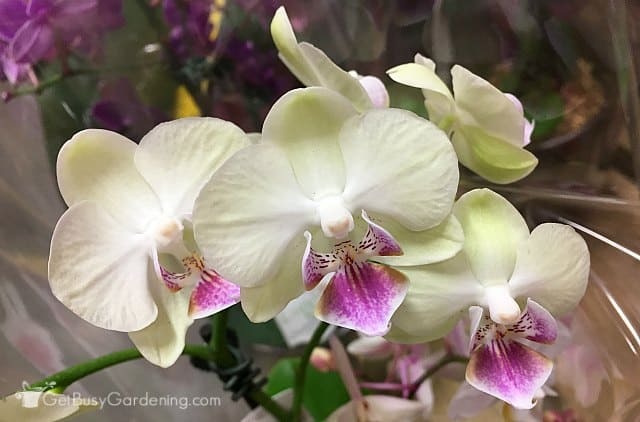 In most cases phalaenopsis orchids are winter blooming plants, making them a popular plant sold at garden centers and big box stores around the holidays. Phalaenopsis orchid blooms last for several months, and will usually last all the way through spring. Some types of orchids can even bloom year round! Once they’re done blooming, the flowers will naturally drop off in the spring, which is normal. Will My Orchid Rebloom On It’s Own? 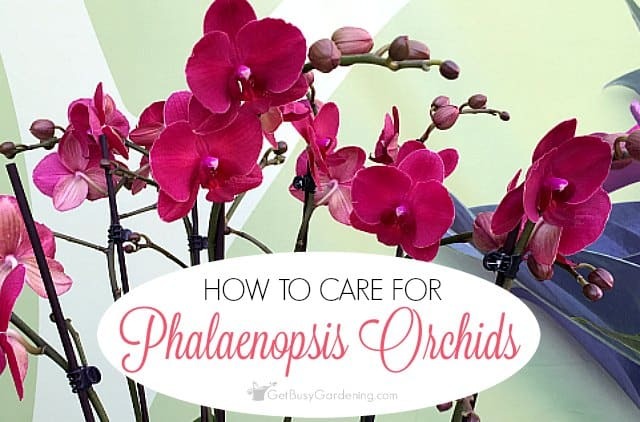 Phalaenopsis orchids are one of the easiest orchids to get to rebloom… but they don’t usually rebloom on their own, so you’ll have to help them out a bit. The trick to getting phalaenopsis orchids to bloom is cooler evening temperatures. It would be best to have it at least 10F degrees cooler at night than during the day (but not below 55F) for at least a week. 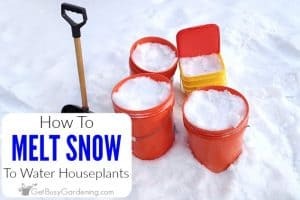 This is easy for those of us who live in cold climates. How can you tell if those are roots or flower buds? 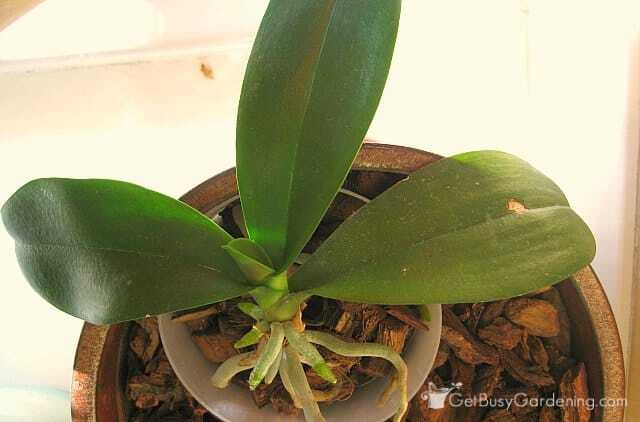 When you’re anxiously waiting to see if your orchid will rebloom, it can be hard to tell if the new growth is a flower spike, or just more roots. There is a subtle difference, so look closely. The roots have smooth and slightly pointed edges (like the ones in the photo above). Bloom spikes will have folds at the tips, and they look kinda like a tiny mitten. If you’ve been religiously following all of these orchid plant care instructions but your orchid still won’t bloom, that’s a sign that it needs to be repotted. 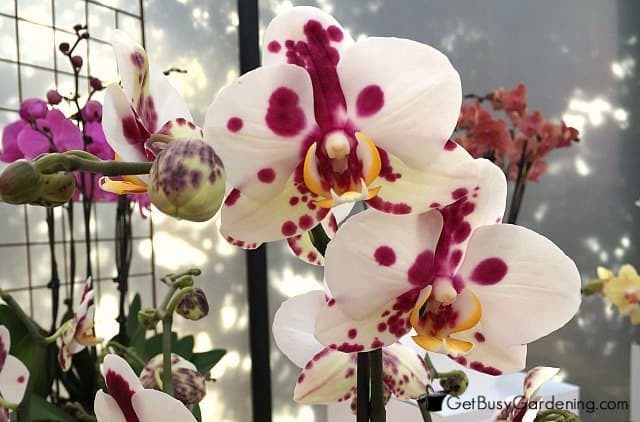 Healthy orchids are usually pretty resistant to houseplant pests, but mealybugs, aphids and houseplant scale can be problems. Organic neem oil is a natural insecticide that is very effective at getting rid of these nasty orchid pests. You can also use a cotton swab dipped in rubbing alcohol to kill mealybugs and houseplant scale on contact, or use an insecticidal soap. Never use chemical pesticides on houseplant pests though because they can build up a resistance to chemicals, only making the pest problems worse. If you’re thinking about trying your hand at growing an orchid (or maybe you got one as a gift! ), then follow these simple orchid plant care instructions, and you’ll enjoy your orchid for years to come (heck, you’ll probably have a whole collection of orchids soon!). Do you grow orchids? Share your orchid plant care instructions and tips in the comments below. 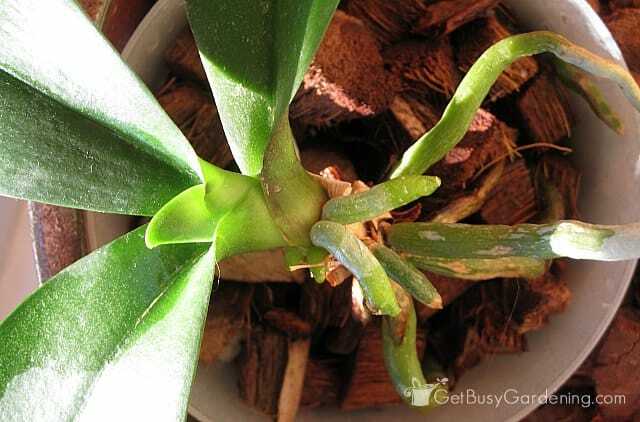 Your Phalaenopsis orchid looks healthy with new shoots coming out. Mine just bloomed this month too, can see the blooms at the sidebar of my blog. Thanks for sharing the information and hope yours will have spikes soon! Thanks for the good luck, I will need it! Your orchid blooms are beautiful. I can't wait to see what mine look like. Looks like your orchid is well on its way to blooming! Personally I like the fleshy roots of moth orchids just as much as the flowers, but thats just me. 🙂 My mom has a phal that's just starting to put out a flower spike, and it just finished blooming in summer! That would make two blooms in one year, so I hope its not just a fluke. Thanks for entering in my contest! Hi Rainforest Gardener! I hope you're right and that my orchid will bloom soon! I'm dying to see what the blooms look like. Thanks for hosting the contest, can't wait to read all the entries! Make sure that your Phal gets at least a week of temps below 55 at night. I had bought one that was in bloom and I kept it in the house. We were living in NC then. It never bloomed again until we moved back to Florida and I moved it outside. Once it went through fall when the night temps dropped….it bloomed. I later read an article which said that it needed the cold night temps to bloom. Thanks for this. I was recently given a beautiful orchid and I have been wondering if I could get it to bloom again when it stopped. I am pinning this for later! You’re welcome!! Good luck with it! 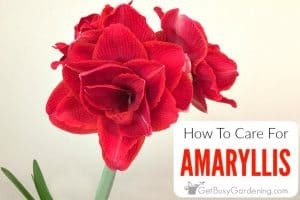 Do you need to cut off the stem once the flowers drop off? Leave it on because many times more blooms will form. You can cut it off once it dries out and turns brown. Oops! I cut the stem off while it was still green. Any advice? My orchid (phal) was a gift I didn’t really want, somehow, with next to zero care it has not only survived, but still flowers. Today I decided to give it some love. I have trimmed off everything brown and faded and papery. Now it looks like it is climbing out of the pot! Is it best to pot it in a deeper pot? Also something has grown out of the bottom of the pot, looks like a whole new plant, could this be so? Thanks for the info from this page! LOL, beginners luck I guess! 🙂 Yes, if your orchid has outgrown it’s pot, then you could repot it into a larger one, just be sure you use a potting medium for orchids rather than regular potting soil. The thing that’s growing out of the bottom of the pot could be a new plant, or it could just be more roots. Hi, I just gave my daughter loves orchids and has quite a few fake ones so I surprised her with a real live one on her recent b’day. Oh, you should have seen me in the store trying to choose the best looking one, lol . . . took me almost an hour! The tag attached to the plant said it should only be watered with an ice cube twice a week. Now, after reading your care guide, I’m a little confused. I’m asking on her behalf since I’m quite certain I’ll be the one actually caring for her plant, lol. It’s funny how many people ask me about watering plants with ice cubes. It seems that many types of plant tags recommend doing that, and I have no idea why. Orchids are tropical plants that are sensitive to cold, so it seems dangerous to water them with ice cubes (especially for newbies). And if the ice was placed on top of the roots, I would be worried that it would cause damage to them. Anyway, I recommend watering your orchid with tepid water. You can wait until the medium is dried out, then water it really well until water is running out of the drainage holes and the medium is wet. Allowing the pot to soak in water so that it can absorb the water from the bottom also works great.